After Simon was born, and maybe a bit before, I had two goals for mid-October. First I wanted to have lost enough weight to wear my suit for a presentation I had for school. I met that goal. I still have about 6 pounds to go to my pre-pregnancy weight, but I’m right around my wedding weight, which is when I bough the suit. 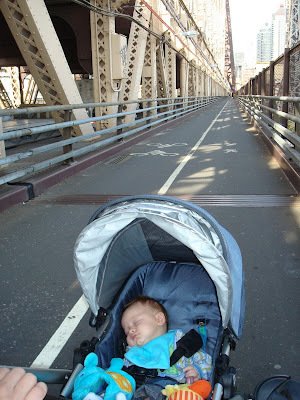 The second goal was to be able to walk over the bridge to Simon’s 3 month pediatrician visit. We used to walk the bridge to Manhattan several times a year when it was nice out. But this past spring I was too pregnant for a 4-5 mile walk. And then I was recovering this summer. I thought 3 months would be a good length of time to give myself and the weather would still be nice. Honestly I think I probably could have walked to the 2 month appointment. So we loaded up the stroller, had some coffee and our water bottles and took off. We usually walk Queens Boulevard, but this time we walked a block over to avoid the noise of the 7 train. There has got to be a prettier street to walk. Maybe next time we’ll find it. There has been construction at Queensboro Plaza for the past couple of years. It’s been so that they could put this park and bike/walkway in. I have to say it’s nice to no longer have to climb over the construction barriers to cross the street. We made it across the bridge and to Dr. B’s upper east side office in about an hour and 15 minutes. Not too much slower than our pre-stroller average time. 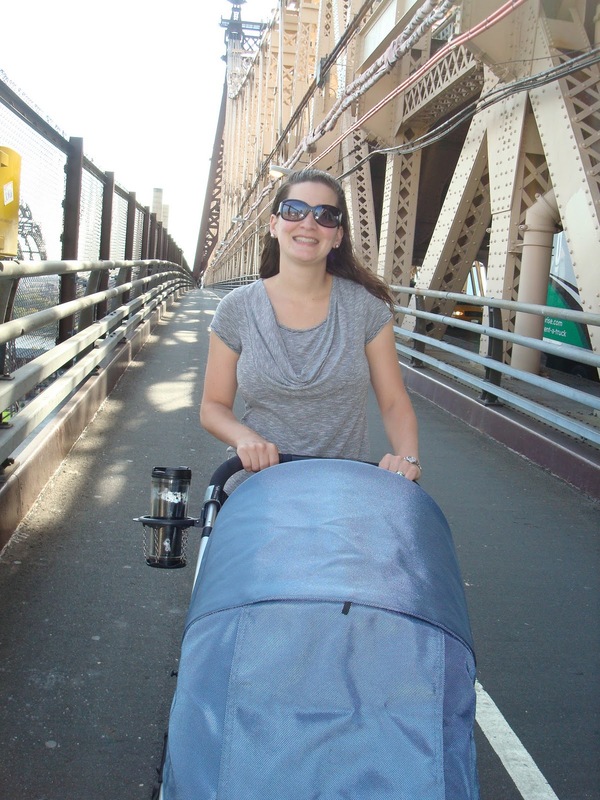 Pushing a stroller makes the bridge a tougher climb. Simon slept most of the way. Simon did great at the appointment, only fussing a little for his shots. He didn’t pee on the doctor this month. And he likes looking at the fish in the waiting area.